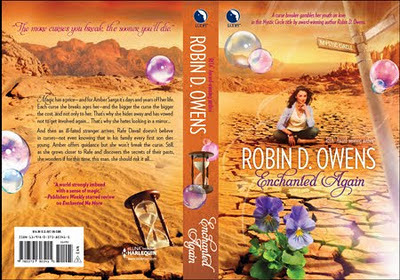 On Writing & Publishing by Robin D. Owens: Enchanted Again Available! Not sure how it happened, but it's available on amazon for shipping...THOUGHT it was available for download but not until Jan 1st. Weird. Could someone have told the author? Amazon told me my preordered copy has shipped! Hope it arrives on time. Hearts and Swords came late - a week after BAM had it in stock. Amazon said mine was shipping & due tomorrow. Can't wait. Amazon sent my mine a few days ago. I got around to reading it last night and early this morning. I really liked it. I think I liked it better than the first one. Will there be nine stories in this series since there are nine houses on the cul-de-sac? Thanks, folks. Thanks, Tine. Yes, I will be doing 9 stories, one for each of the houses -- I have a last contract for #3 with Luna (next ms to be written), but if they don't want to renew the series, I'll do it on my own. Sigh... apparently it's shipping, but not available on the Kindle until Jan 1!